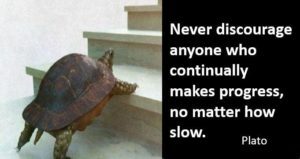 Home » Life Coaching Blog » Don’t Curse Your Inner Turtle! My encouragement to you is simple. Don’t curse your Inner Turtle. Don’t give up. Don’t give in. Don’t relinquish what you know will bring you to a higher and better place. In a world that addictively craves quick fixes and short-term gratification, do not be discouraged in your own growing process. Don’t give up on yourself. If it’s slow, let it be so. Learn the three things to watch for when moving slowly and the three benefits of moving slowly. Excuses. Avoid creating unnecessary slowness, detours, or relapses. Unproductive or destructive patterns not correcting. The insanity of repetition, expecting a different outcome will not get your to the finish line. Regret for time lost because of internal resistance. Remember life is precious. Time is precious. What you cherish is precious. Do not squander the good. You minimize impulsive destruction. You have time to think, reflect, meditate, pray, get good advice, or change or mind. You relax, conserve your energy, and pace yourself as you’re arriving at your destination. Opportunities to learn, understand, grow, contribute, and participate expand, sometimes bring surprisingly wonderful gifts!